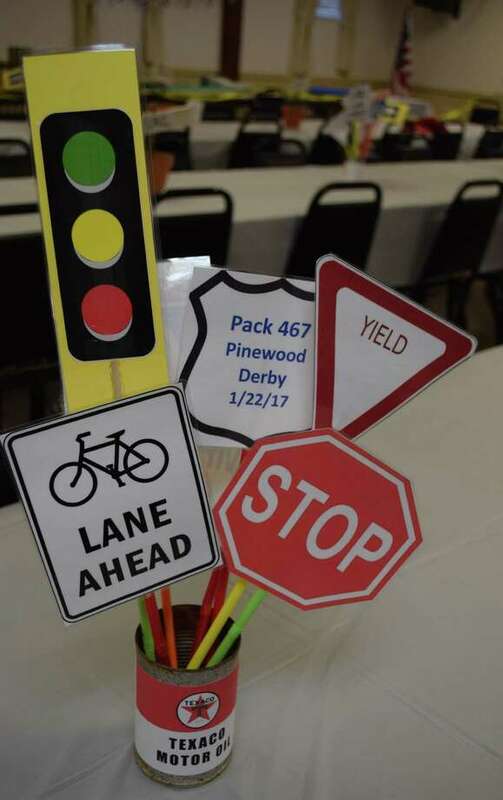 Spectrum/A variety of road signs greeted patrons of Cub Scout Pack 467's annual pinewood derby held Jan. 22, 2017, at the Odd Fellows Hall in New Milford. Spirits were high as cars zipped along the track Saturday during New Milford Cub Scout Pack 467’s annual pinewood derby. The event, which took place at the Odd Fellows Hall, drew a large crowd. Competitions took place for Lions, Tigers, Wolves, Bears, Webelos and Arrow of Light, followed by the finals, with the top three cars from each group participating. During the award ceremony, an assortment of awards were given in a variety of categories, including Most Patriotic car, Coolest car, Funniest car and Best Workmanship, among others. Winners in the derby race for siblings of Scouts were honored. Trophies were presented to: for Lions, Ashton Davis (first), Owen Shields (second), KarlHeinz Berendsohn (third) and Chase Moran (fourth); for Tigers, Wesley Davis (first), Sigge Dahl (second) and Curran Palancia (third); for Wolves, Ryan Ma (first), Oliver Brandel (second) and Liam Cooley (third); for Bears, Nathaniel Dempster (first), Zach Johannsen (second) and Thomas Setear (third); for Webelos, Jackson Higgins (first), Connor Rivera (second) and Carter Brandel (third); and for Arrow of Light, Benjamin Agnor (first), Daniel Vrba (second) and Justino Martins (third). The Scoutmaster Cup trophy was given to the Arrow of Light Scouts for being the den with the overall fastest cars, and the top finishers for the day were honored: Jackson Higgins (first), Carter Brandel (second) and Connor Rivera (third). of the derby, visit newmilfordspectrum.com.